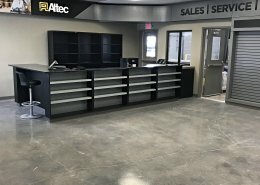 When Altec Industries needed a conversion of their old service location to a new, well-designed, merchandising and sales space, they knew to call on Method-1 Branded Interiors. Altec is a leading provider of products and services to the electric utility, telecommunications, tree care, lights and signs, and contractor markets. This project for Altec serves as more than just a place for shopping. It was designed as a place where people learn about products and build a relationship with a their brand in a physical space.